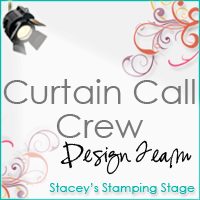 It's that time again...I have another fabulous color challenge to bring to you, courtesy of Stacey's Stamping Stage! This set of colors is one of my VERY favorites so far...when I first saw it, I couldn't wait for the week to come! Without further ado...here are the fabulous colors we are challenging you with this week! Instructions: Fold pink cardstock in half to make card base, and round the bottom corners. Round the bottom corners of a kraft cardstock block, and stamp the damask pattern to it. Adhere the block to the front of the card. Glitter the white paper rose and adhere to the top of the card. Add two pink paper flowers with leaves to each side of it. Tie a bow with pink dotted ribbon, and tuck into the top of the flowers. 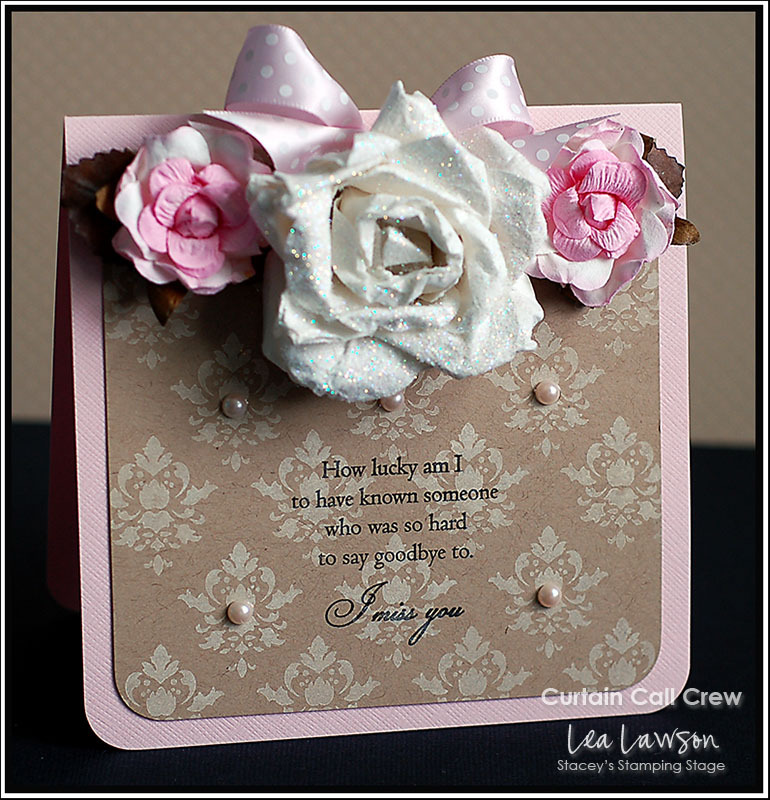 Stamp the sentiment to the middle of the card, and accent with pearls. This card is stunning! I love the flowers and the combination of pink, brown and white. Great job! oooo, i love these colours, too!! i'll definitely have to participate. Stunning card! Such a great interpretation of the photo! Oh my gosh those flowers are FAB!! The damask stamped on Kraft is so beautiful and perfect for your card design! Too gorgeous! This is just absoloutely beautiful. That center flower is just...well I don't even know what to say! Lea, WOW! When I first saw those colors, it made me think of something yummy to eat and then I saw your card that looks even more yummy! Oh, so pretty! Love the flowers! The pearls you've added to the flourishes are the perfect touch! Just gorgeous Lea! I love those colors too. I may have to try out a new challenge... hmmm! This is gorgeous! Your photography is super too!!! I wish I could get my photos that big on my blog...you must have a secret! you totally rocked this challenge--the flowers are amazing, and you mimicked the wallpaper perfectly! This card makes me happy, too! Aside from the absolutely beauty of the card, the sentiment so heart felt. I LOVE it, Lea!! A true masterpiece! Good golly Ms. Lea, this is uber gorgeous! You mimicked that wallpaper fabulously! your flowers are beautiful and the colors are perfect for a spring flower! This card is truly beautiful. The saying on it is one I had to write down. I lost my best friend at the young age of 38.....and these words touched me.